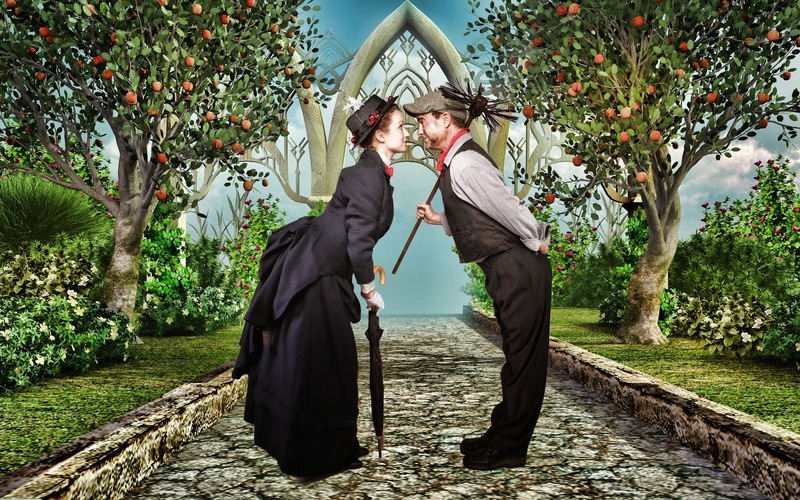 Recent Broadway sensation, Disney’s and Cameron Mackintosh’s Mary Poppins, The Broadway Musical, sweeps metro-Atlanta with laughter and fun to open Aurora Theatre’s 19th Season Signature Series July 17-August 31. 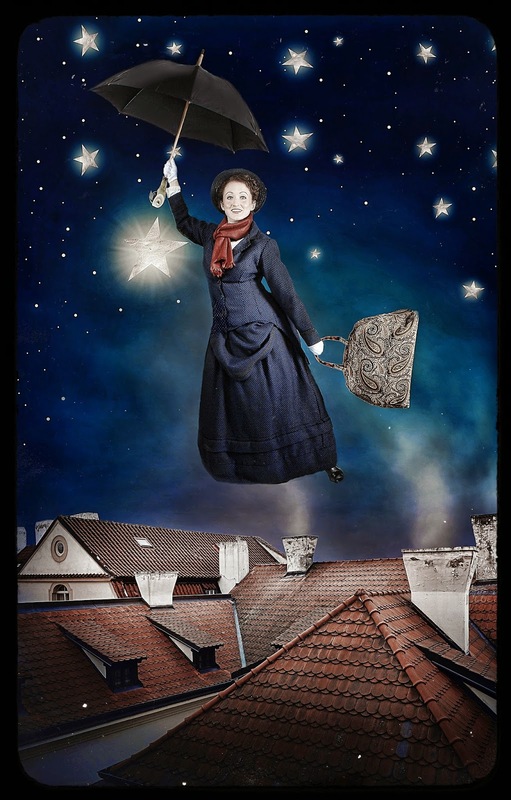 Co-created by Cameron Mackintosh with additional music and lyrics by George Stiles and Anthony Drewe, the musical tells the story of everyone’s favorite “practically perfect” nanny who falls from the sky and into the hearts of the dysfunctional Banks family. 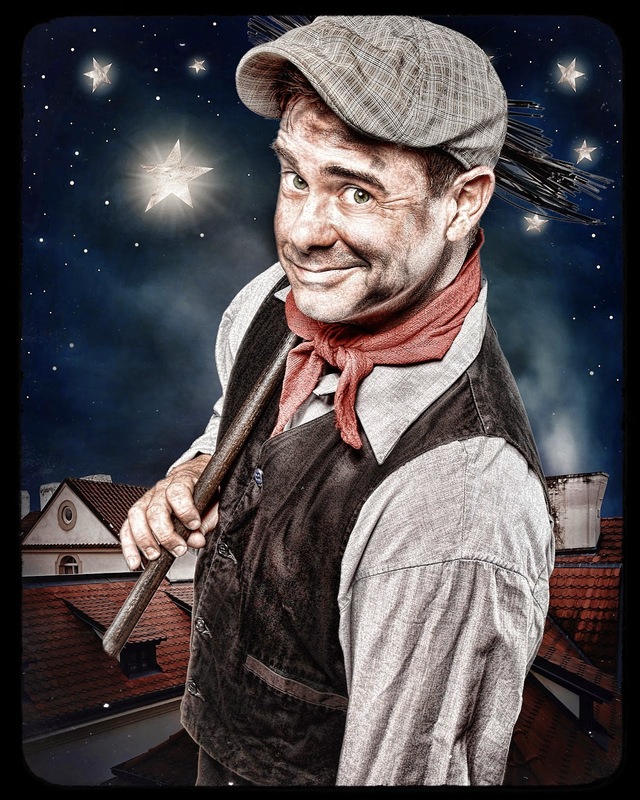 With the help of a carefree chimney sweep named Bert, she teaches the family the immeasurable benefits of love, joy and mutual respect for one another one magical lesson at a time. Produced with dazzling theatrical effects and a score that includes Chim-Chim Cher-ee, A Spoonful of Sugar and Step in Time, rediscover the Walt Disney classic that has touched the hearts of audiences for more than 45 years. A musical based on the stories of P.L. Travers and the Walt Disney Film with original music and lyrics by Richard M. Sherman and Robert B. Sherman, Mary Poppins promises to be the biggest spectacle in Aurora Theatre history with a production even bigger than last season’s unparalleled hit Les Misérables. Aurora has enlisted the aid of D2 Flying Effects to help create some of the magic moments and 200 unique and period-specific costumes have been created for this production. The 28-person cast includes Galen Crawley (Shrek the Musical; Alliance Theatre) as the iconic, magical English nanny Mary Poppins. As Mary’s artistic and mischievous sidekick Bert, is Andy Meeks (Rent; National Tour) who returns to the stage after a four-year absence to start a family and help start the company Scoutmob. The cast also includes standouts William S. Murphey as George Banks, Liza Jaine as Winifred Banks, Heidi Cline McKerley as Miss Andrew, Geoff Uterhardt as Admiral Boom, and Jessica DeMaria as Mrs. Brill. The cast also includes four adorable youngsters who will alternate playing the Banks children with Mabel Tyler and Sarah Carroll playing Jane, and Joseph Masson and Benjamin Harding as Michael. Aurora Associate Artistic Director Justin Anderson directs and heads the talented creative team including Aurora Theatre Associate Producer and Resident Music Director Ann-Carol Pence and choreographer Jen MacQueen. Making the magic happen is the design team of Shannon Robert (set), Sydney Roberts (costumes), Mary Parker (lights), Ryan Bradburn (props), and Daniel Terry (sound). · Wednesday- Friday: 8 p.m.
· Saturday: 2:30 p.m. & 8 p.m. 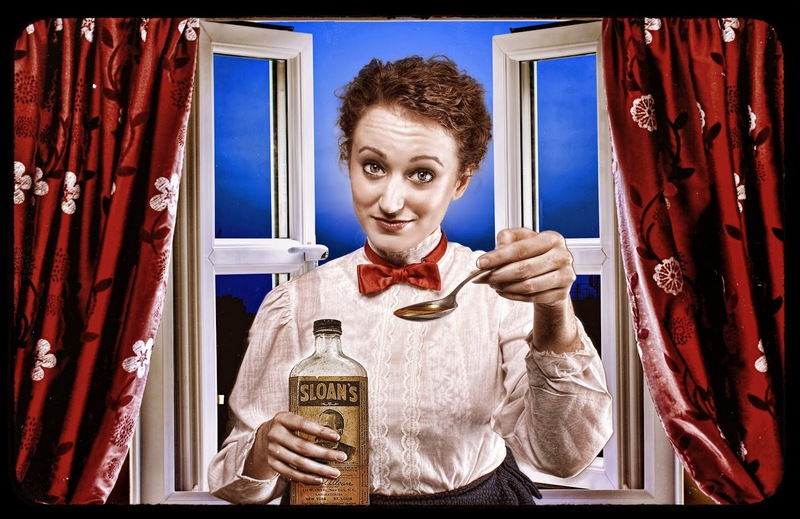 Exclusively for this production, youngsters ages 6-12 are invited to participate in a Jolly Holiday Party on Saturday, July 26 and August 16 at 1:15 p.m. The festivities include activities and photos with Mary Poppins and Bert, as well as a special snack. Tickets are $10 per person with purchase of a ticket to the corresponding day’s matinee. The City of Lawrenceville’s Downtown Development Authority (LDDA) and Aurora Theatre invite the community to celebrate the Arts on July 19 and do the Chalk Walk! 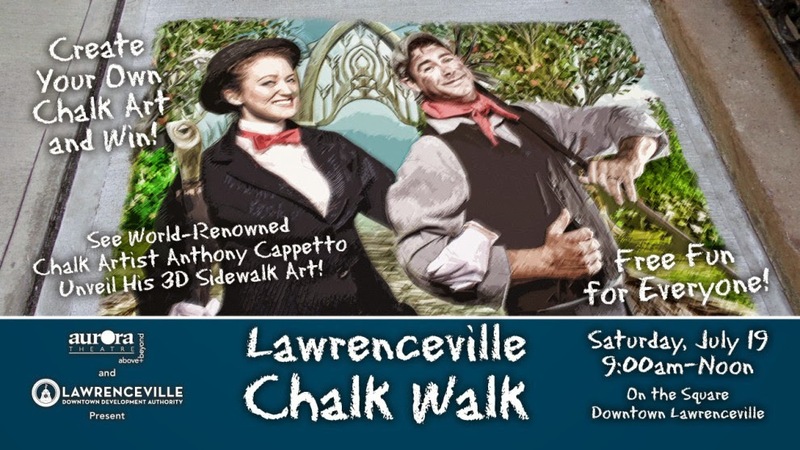 Inspired by Aurora Theatre’s season opener for the 2014–15 season, Mary Poppins, Lawrenceville’s Chalk Walk will provide residents, visitors and amateur artists the opportunity to showcase their talents on the sidewalk in Downtown Lawrenceville. To register for this free event, please click here. Artists of all ages are invited to showcase their chalk drawing talents between 9:00am and 12 noon, July 19 on the Lawrenceville Square. Participants are encouraged to register and bring their registration form to the Chalk Walk booth at the Lawrenceville Farmers’ Market on the day of the event. Thanks to the Local Republic restaurant, chalk will be provided free-of-charge and designated drawing spaces for participants will be assigned at check-in. Disney’s Mary Poppins, The Broadway Musical was adapted from the novel written by Julian Fellowes and the motion picture produced by Walt Disney Productions; it is presented through the Peach State Federal Credit Union Signature Series.